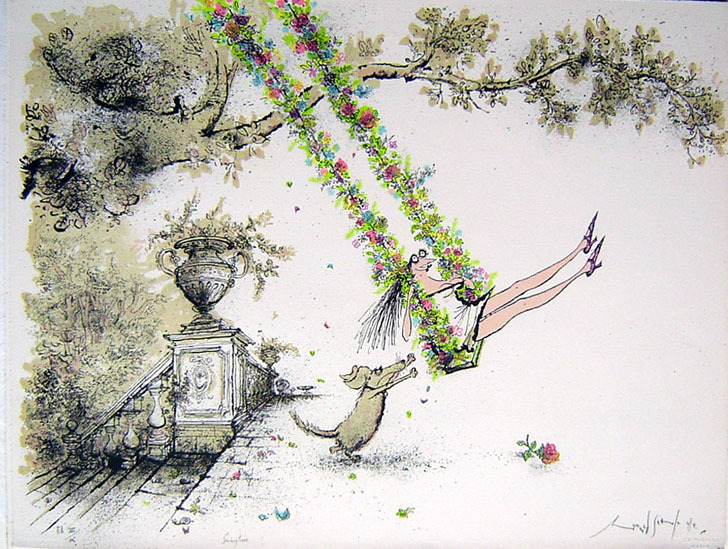 Ronald Searle was born in Cambridge, started drawing at the age of five and left school at the age of fifteen. When World War II broke out, he enlisted, and joined the Royal Engineers. He trained for two years in the United Kingdom, and, in 1941, published the first St Trinian's cartoon in the art magazine Lilliput. In January 1941, he was stationed in Singapore. After Singapore fell to the Japanese, he was taken prisoner along with his cousin Tom Fordham Searle. He spent the rest of the war a prisoner, and worked on the Siam-Burma railway. While a prisoner, he made drawings of camp life, which he hid under the mattresses of prisoners suffering from cholera. Searle was victim and observer and recorder of atrocities and diseases and deaths. He never stopped drawing, despite beatings, bouts of malaria and beri beri, and a Japanese guard's pick axe in the back. He was liberated in 1945, and took the surviving drawings home with him and published them in The Naked Island written by fellow captive Russell Braddon.. He married Kaye Webb in 1947 and they had twins, Kate and Johnny. Searle produced an extraordinary volume of work during the 1950s: drawings for Punch, cartoons for the Tribune, the Sunday Express and the News Chronicle, along with more St Trinian's books, Molesworth, as well as travel books, animation for Disney, and advertisements, posters etc. He received recognition for his work, including the National Cartoonist Society Advertising and Illustration Award in 1959 and 1965, the Reuben Award in 1960, their Illustration Award in 1980, and their Advertising Award in 1986 and 1987.. In 1961 he left England and moved to Paris, where he married Monica Koenig. In France, he worked more on painting, and less on cartoons, leading to a series of paintings entitled "Anatomies and Decapitations". He continued to work in a broad range of media, and produced books (including his well-known cat books), animations for films, even designs for medals.. In recognition of his achievements, Ronald Searle was made Chevalier de la Legion d'Honneur. by the French Government. His work has had considerable influence on later cartoonists, including Matt Groening, among others..
A lithograph is a unique original work that exists only in that form. The separate part of each drawing to be printed is drawn with lithographic ink or crayon on a stone, or a specially treated sheet. For say, ten colours, there are ten separate stones or zincs. The original exists only when all ten stones are printed onto one sheet of paper. The plates are etched in the traditional way, and to print an edition of 99 copies takes about one week of work. At this rate, Searle produced one print a month. There is no original drawing from which the lithograph is copied: the subject is drawn freehand onto stone. An ARTIST’S PROOF (Marked EA - Epreuve Artiste) is one of only ten lithographs which are the first to come off the presses. The artist makes slight adjustments to the first ten, until he is satisfied that the longer run of prints can go ahead. The stone plates are then handed over to the printers to finish off the run. As each of the Artist's Proofs are tinkered with in some way, they become unique as they are slightly different to any other lithograph in the run, hence the increased price. The HORS DE COMMERCE (HC) are prints outside the edition but are the same as the edition and are used as gifts or payments to those involved in the production of the edition. They are marked "HC" and are usually numbered but not always. 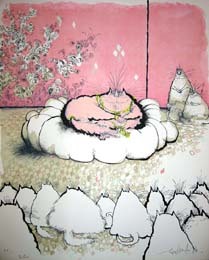 The limitation (in Searle's case ninety-nine, plus the artist's proof) is arbitrary, and dictated by the cost of paper and labour of printing, and the high cost of an edition which was financed by Searle himself. If you are looking for a particular lithograph not listed in this gallery, please email jt@art-of-illustration.co.uk and we will check availability.